We recently rented Boxberry for a family reunion and it was perfect. The home is beautifully decorated and is well stocked to accommodate our party of 8 adults and 3 kids. Bonus:We loved coming home from our outings each day to see the black angus cows grazing around the fields behind the house. The one thing I would suggest to the owners is to update the guest cottage a bit. It seems a bit dated compared to the rest of the house, although it does have nice marble bathroom counters. We would definitely rent this home again!! Working with the staff at Stay Charlottesville was a pleasure. I was so glad I stumbled upon them.The Locust ave cottage was great and very comfortable. Our staff was unrushed and very restful. We recently stayed at the Locust ave Cottage and were very pleased with the accommodations and the location. The cottage was comfortably furnished and had all the amenities we needed. The neighborhood was quiet and great for taking long walks. It's location close to the downtown mall and convenient to hiking and wineries made it ideal. We will definitely consider renting this cottage the next time we are in Charlottesville. The house was amazing, with loads of room, lots of high-end features and a great kitchen. The bedrooms were far enough apart from one another that nobody was disturbed. The master bath was fabulous with a deep tub and a great shower. The Cottage was great for a young couple with kids or someone needing more privacy. Everything worked and there was a beautiful yard with play equipment for kids. This home was amazing! 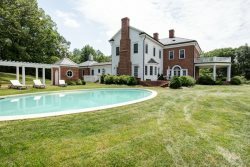 set amidst the Blue Ridge Mountains and Monticello Wine Trail, this gorgeous, well equipped 5 bedroom estate is the perfect house for bringing the extended family together for a vineyard wedding or vacation! All you need to bring to this house is your family or friends, clothes, and groceries. The rest is all here!